Grotesque can be seen as a forerunner of Millennium. According to an interview with James MacLean and Troy L. Foreman for Back to Frank Black, Carter had been approached by Fox to produce a second television series during the second season of The X-Files. So Millennium was very clearly gestating at this point. It is very easy to see the influence that Grotesque would have had on Millennium, to the point where it is easy enough to reimagine Grotesque as an episode of Millennium. In that respect, then, Grotesque fits alongside a collection of stories from the second and third season of The X-Files that seem to be building clearly and consciously towards the launch of Millennium in October 1995. Irresistible is perhaps the most obvious example, another story about a serial killer scripted by Chris Carter. However, the millennial and religious subtext of Millennium can be seen at work in episodes like The Calusari and Revelations. I also think Grotesque may have been the template for Chris Carter’s new show, Millennium, because it is quite the same storyline, with someone becoming the person he’s hunting; driving himself into the darkest, deepest corner of his mind. Asking the question, What is evil? And then experiencing evil so that he can recognize it and therefore capture it. I think Grotesque is a frightening show. I think it is a disturbing show, and I think that’s why – for me – it’s such a good show. We pulled off making the viewer feel uneasy. I even found it a difficult show to watch. 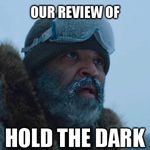 Yeah, it was a pretty dark hour of television, and I would like to do more of those. 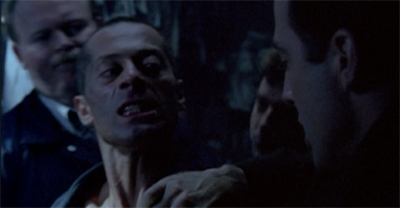 Grotesque forges a clear link between Mulder and the character who would become the protagonist of Millennium, Frank Black. However, as much as Grotesque draws from the success of Irresistible, the episode also draws from a number of less successful first season stories. The first season was packed with episodes that featured characters returning from Mulder and Scully’s past. 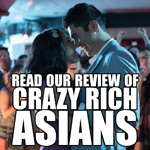 The show awkwardly tried to develop back story and material for the duo with a number of clumsy scripts. Carter and Howard were among the most prolific offenders of this approach to first season characterisation. 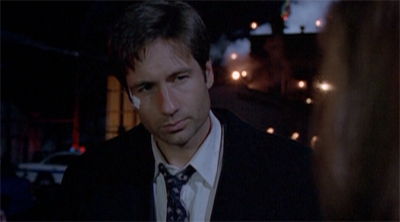 Gordon’s script for Ghost in the Machine featured Mulder’s ill-fated former partner, allowing the audience a glimpse at who Mulder had been. (Gordon was also responsible for Conduit, the first script to explicitly tackle Samantha’s abduction.) Carter gave Mulder a British ex-girlfriend in Fire and a former FBI supervisor in Young at Heart. The way that Grotesque introduces Bill Patterson as Mulder’s former mentor at Behavioural Sciences could be seen as a return to this sort of awkward expositional storytelling. Luckily, it isn’t. Grotesque does a much better job with Patterson than Young at Heart did with Reggie Purdue, Fire did with Phoebe Green or Ghost in the Machine did with Jerry Lamana. Some of this is down to the fact that it’s a storytelling tool that hasn’t been overused in a while, but it’s also down to the writing and performances involved. Patterson feels like a character in his own right, not a contrived story element. His presence makes more sense here than any of the other examples cited. It makes sense that Mulder would have had a mentor in Behavioural Sciences, and it makes sense that this mentor might want Mulder to consult on a case. More than that, Patterson feels like he could exist independent of his relationship with Mulder. It’s easier to imagine Patterson headlining his own weird profiling show than it is to imaging Purdue, Green or Lamana outside the context of their episodes. 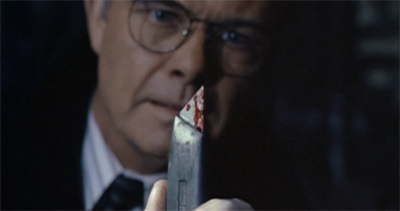 More than that, Bill Patterson is played by the wonderful Kurtwood Smith. Smith is best known these days for his work on That 70’s Show, but he has a long and rich history of genre work stretching back to Robocop and beyond. Smith has a fantastic screen presence and gravitas. Thanks to Smith’s performance, it really isn’t that hard to imagine Patterson as a regular character on some other procedural show. The episode also takes pains to make Patterson seem multifaceted. He doesn’t feel like a two-dimensional cut-out grafted into the plot so the show can assure the audience that Mulder used to do stuff outside the X-files. We learn as much about Patterson as we do about Mulder. 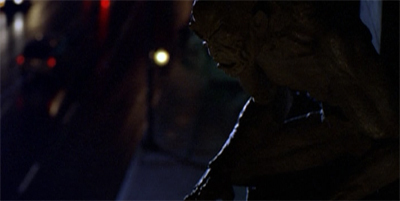 More than that, the expositional dialogue about the relationship between Mulder and Patterson is shifted to characters like Scully and Nemhouser. 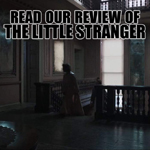 It is very good writing, very careful and very precise. And time can do… soooo much…. Having Patterson come right out and describe Mulder as a brilliant profiler – as Green, Purdue and Lamana all do – feels lazy. It is a very cheap way of the audience telling us something about Mulder. So the information doesn’t come from Patterson. “Late at night, with a few beers in him, he starts telling me Mulder stories,” Nemhouser tells Scully. That’s a detail that doesn’t just tell us something about Mulder, it says a lot about Patterson. The fact he can’t say it to Mulder is as important as the fact that he said it at all. Similarly, the fact that Patterson doesn’t just ask for Mulder, but instead tries to subtly request him, makes it feel like the respect is a lot more genuine. It is easy for somebody to boast about the skill of a friend or lover; it is a lot harder for a person to acknowledge the skill of somebody they genuinely dislike. The strange cocktail of contempt and admiration that Patterson feels for Mulder doesn’t just serve as a connection to Mulder’s past, it also makes Patterson seem like a more realised character. However, there are other examples of how Grotesque is re-working concepts that did not work during the show’s first year. 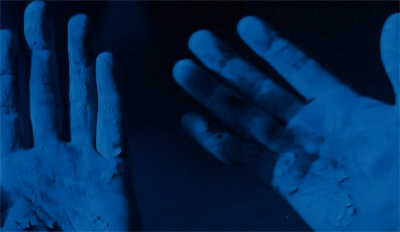 In particular, Grotesque sees Howard Gordon revisiting a concept he used in Lazarus. In that episode, Scully’s ex-boyfriend found himself possessed by the psyche of a crazed killer he had pursued for years. There was some small mystery about whether this was a rational or natural phenomenon; was this a psychotic breakdown, or genuine possession? The script didn’t work for a number of awkwardly contrived reasons, but it is interesting that Carter and Gordon would revisit such an awkward misfire. Grotesque takes a lot of what didn’t work in Lazarus and finds a way to fit it together more comfortably. It is a more ambiguous episode, it is more directly connected to our lead characters, it has a stronger guest cast, it has a better director, it has higher psychological stakes. In many ways, this offers proof of how far the show has come in its first three seasons. Grotesque doesn’t feel the need to be as painfully on-the-nose or forced as Lazarus had been, much like Oubliette does not feel the need to be as overt about Mulder’s motivations as Conduit had been. There has been a very measurable and quantifiable increase in the quality of the writing on The X-Files. This is largely due to the care that Carter has taken to foster and encourage his staff. Indeed, it is a surprise that Howard Gordon never wrote for Millennium. Gordon would depart The X-Files towards the end of the fourth season, to pursue outside opportunities. He worked on Buffy: The Vampire Slayer and Angel, but would go on to more mainstream success with television shows like 24 or Homeland. Given the strength of Gordon’s work on scripts like Grotesque, it seems a surprise that he was not in contention to take over the running of Millennium in its second season, after Carter stepped back. Still, Grotesque is a fantastically-constructed piece of television. 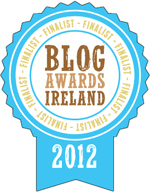 It is very deftly put together. 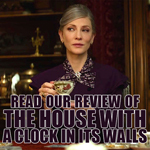 Consider the “whodunnit” mystery that sits at the heart of the episode. While this plot is secondary to Mulder’s character, it is still meticulously crafted. Initially, Grotesque seems to tease the audience with the possibility that Mulder has gone insane staring into the abyss. However, Carter and Gordon are shrewd enough to realise that this won’t fool savvy viewers. There is no way that Fox Mulder will turn out to be a serial killer. So, not only does Mulder’s flirtation with darkness serve as a minor red herring, the episodes provides a second red herring for those canny viewers who know that the lead on a successful network drama isn’t going to suddenly become a serial killer. 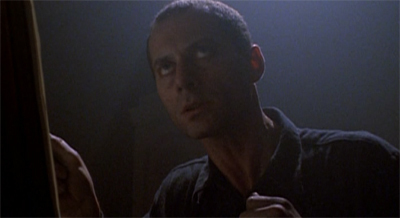 During the teaser, Mostow bites Nemhouser on the hand. Given the way that the episode teases demonic possession as a possible cause of this, the episode is hinting that Nemhouser may have been “infected” be evil in the same way he would by a vampire or werewolf bite. I had spent the better part of a month writing a story that really involved a possession, about the spirit of one particular gargoyle. I wrote a whole draft and literally three days before prep I said to Chris, ‘This episode just is not working.’ He sat with me on a Saturday, and we retrenched. It occurred to me on that morning and at the eleventh hour that this was not a story about an actual demon, but the demo n of one man’s mind. It was roughly the same structure I had done before, but with a completely different and much more internal and psychological story. On The X-Files we have often decided that the psychological is less interesting than the paranormal or external phenomena, but in this case the internal was really the way the story needed to be told, about the duality of people. It’s a story that’s been done before, but I think we added a really unique twist to it. Grotesque largely works because of the way that eschews a paranormal explanation. 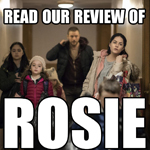 As with Irresistible, there’s a sense that the audience wants a demon or a ghost or a goblin, because that would mean that it was not a human being who had done this. “It found somebody… just like it found me,” Mostow insists, inviting the audience to hope that whatever did this might not be human. That would be a very X-Files explanation, treating this sort of evil as a metaphorical force. Introduced in the very next episode, the “black oil” is perhaps the most obvious example, an entity that infests and corrupts and controls. The episode Empedocles would offer a monstrous evil quite similar to that proposed by Mostow here – something that spreads from person-to-person. However, Grotesque offers its audience no such comfort. There is a suggestion that evil is contagious and infectious, but only on the most abstract of nature. There may be demons, but they are created by men. There is no external force here; there is something that came from inside Mostow, and something that Patterson absorbed through his contact with Mostow. It is not something that can be transferred through saliva or bodily fluids, as comforting as it might be to think of it in that way. Still, the episode pitches this quite cleverly, in such a way that it never over-emphasises the bite; it never feels like Grotesque is paying too much attention to it. Nemhouser screams during the teaser, and Scully notices it in the hospital room. However, Manners never lingers on it and the script never actually suggests that the evil might have been transferred by Mostow’s bite. 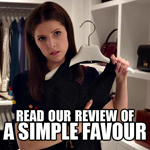 It’s a very clever red herring – one that uses the audience’s expectations against them. The script to Grotesque also benefits from Gordon and Carter’s literalism – the idea that metaphors are not enough on their own, and that they need to be literalised. 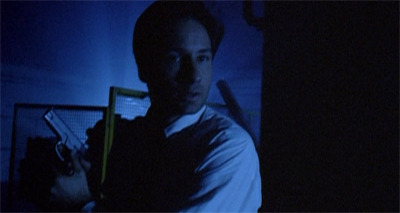 For example, when Mulder finds Mostow’s secret room, he has to venture into the darkness carrying a tiny flashlight. It’s a very effective visual representation of his character arc. “Why don’t you wait until we can get some more light in here?” Scully asks. Mulder, fixated and driven, replies, “I’ve got some light.” He then ventures forth, into darkness. This is the type of approach to script-writing that could easily seem overwhelming or heavy-handed. However, Gordon and Carter go for broke with the material. It ends with Mulder alluding pretty directly to the work of Friedrich Nietzsche. It is not a subtle hour of television. And yet, despite this, Grotesque works; there’s something appealing about the earnestness that Gordon and Carter bring to the script. After all, it is certainly appropriate. This is heavy stuff. Serial killing is a very dark topic. People do terrible things, and even processing the scale of man’s capacity for brutality can give you nightmares. Darin Morgan has spoken about how he was so unsettled by the show’s research material that he wrote Clyde Bruckman’s Final Repose. The script from Grotesque gets quite heavy, but there is a sense that it merits the weight given to it. Tone would become a problem for Millennium. 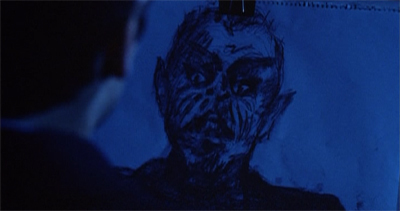 The heavy and oppressive atmosphere of Grotesque works because The X-Files is not always this dark. The show is not unrelentingly grim. 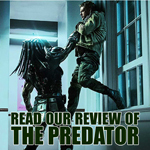 Grotesque follows directly on from two comedy episodes, and leads into two action-packed hours of adventure. The X-Files would become exhausting if every episode of the show strove for this tone. The first season of Millennium would have great difficulty figuring out how to offset all that darkness and weight. Carter and Gordon’s collaboration on F. Emasculata was notable because it coincided with the mid-nineties obsession with ebola and other infectious diseases. It seemed like the two writers had their fingers on the pulse. Grotesque seems to tap into the mid-nineties fascination with serial killers. This isn’t anything new. The character of Dana Scully is very heavily influenced by Jodie Foster’s performance as Clarice Starling in The Silence of the Lambs. Nevertheless, Grotesque seems to reflect contemporary anxieties. In particular, the show’s mood and atmosphere seem heavily influenced by David Fincher’s se7en. The serial killer thriller was released about five months before Grotesque hit the airwaves. In particular, the sequences of Mulder looking through classical records and books for clues cannot help but evoke Detective Somerset’s trip to the library for a similar purpose in se7en. 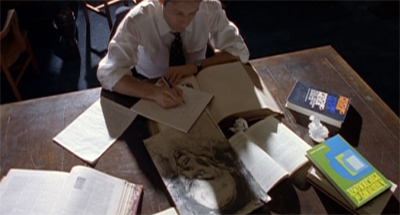 Mulder’s research montage might as well be set to Air on the G-String, feeling like a rather overt shout-out. Of course, Grotesque also pays homage to the work of Thomas Harris, the writer who largely invented the “serial killer profiler” subgenre with Red Dragon. As noted about, Harris was a major influence on Scully’s character. However, his influence on Mulder tends to get glossed over. Mulder seems like he was loosely modelled on the character of Will Graham – a particularly sensitive profiler who found himself driven over the edge in his pursuit of monsters. In a nice little touch, Mostow seems like a serial killer from a Thomas Harris novel. He is using the bodies of his victims as raw materials. Jame Gumb was fashioning himself a people suit in The Silence of the Lambs, while Hannibal Lecter harvests his victims for meat. Mostow uses the bodies of his victims to make clay gargoyles. It’s a very unsettling sequence, one that says a lot about how the killer sees his victims. Not only did Douglas do a lot to develop profiling as a credible means of investigation, he also helped to define the archetype of the profiler in popular culture. I was in my thirties in December 1983 when I collapsed in a Seattle hotel room while working on the Green River Murders. I came down with severe viral encephalitis that basically shut my brain down. I was in a coma at Swedish Hospital for a week and not expected to live. They even picked out my burial spot in a Veterans Cemetery. I was handling so many cases at the same time, travelling so much, feeling this intense pressure from the Bureau and responsibility to all the victims and all the individuals who would become victims if we didn’t take some of these serial killers off the street, I had this premonition something was going to happen to me. In fact, just before I left on the Seattle trip, I took out additional life insurance. This may be responsible for the “forensic profiler has a breakdown” stories that recur in popular culture. It was a heavy influence on Thomas Harris’ Red Dragon, to the point that Bryan Fuller wrote viral encephalitis into his own version of Will Graham’s breakdown. Unfortunately, my situation isn’t unique in this business. Most of the other agents who’ve worked with me as profilers and criminal investigative analysts in the Investigative Support Unit have suffered some sever, work-related stress or illness which kept them off the job for some period of time. The range of problems runs the gamut – neurological disease like mine, chest pain and cardiac scares, ulcers and GI disorders, anxieties and depression. Law enforcement is a notoriously high-stress environment to begin with. While I was home recuperating, I did a lot of thinking about what it is in our job that causes the particular kind of stress that’s at least different and may even be greater than that of some other FBI agents, detectives and police line officers – people who face immediate physical danger far more often than we do. Perhaps the abyss really does gaze back. While the “tortured forensic profiler recovering from a breakdown” might have become a cliché in the years ahead, Grotesque is still early enough in the cycle that it works. Given how Mulder gets swept up in the killer’s psyche over the course of a week, it makes it all the more plausible that Patterson could have been worn down after three years of trying to dig into the psyche of Jonathan Mostow. It is truly horrific and unsettling. 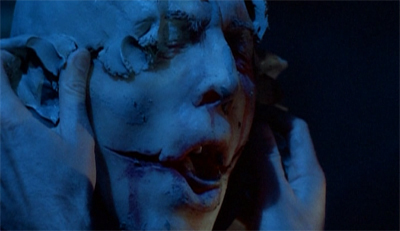 Kim Manners does great work with Grotesque. It is startlingly dark piece of television, to the point where it is difficult to see what is going on at points. That darkness works very well, shot in shades of deep blue. 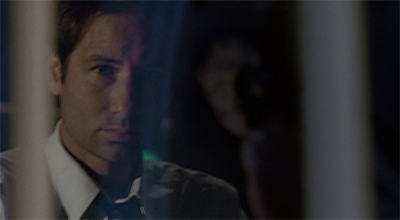 There is a sense that Mulder is at the risk of being consumed by darkness, devoured by it. The lighting, the sets and the production design on Grotesque are all absolutely fantastic. Grotesque isn’t just a fantastically-written piece of television, it is superbly constructed. Grotesque is a fantastic piece of work, and a credit to all involved. It sets the perfect tone for Millennium, a show that will launch later in the same year. It is easy to see why Fox might have been convinced to run with it, based purely on the strength of this instalment.